Between 1998 and 2017, the gray-divorced population has almost doubled; the number of divorced adults age 50 and older has increased from 6 million to 17.1 million, according to GfK MRI spring studies. Early Baby Boomers (born between 1946 and 1955) was the first cohort to increase the gray-divorce population, followed by late Baby Boomers (born between 1956 and 1964). In 2015, when GenXers began to reach the half-century milestone, an additional 1.7 million counted as gray divorcees. Many reasons explain why couples divorce after years of marriage. Women are more likely than men to initiate a divorce—the proportion of divorced women always exceeds the proportion of divorced men, because men are more likely than women to remarry. Because 60% of remarriages end in divorce, some men have more than two former wives. Today, more women than previously are employed, have higher education, and are independent. Even women raised in the era when the expectation was that men provided (financial) security in exchange for all supporting services associated with hearth and home, few women today are willing to remain in an unfulfilling marriage. Unfortunately, except for wealthy households, half of a couple's assets are insufficient for former spouses to live in comfort or into retirement. Because of the pay gap, more women than men are financially challenged. Few VALS™ Achievers and Experiencers are in the gray-divorce population, because few have turned age 50. 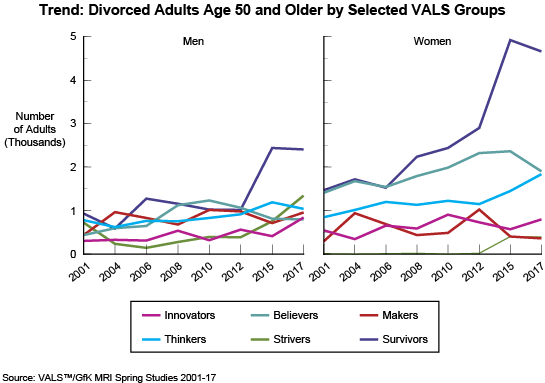 Overall, Survivors are the most likely of the groups to be gray divorcees, followed by Believers, Thinkers, Innovators, Strivers, and Makers. By gender, the percent in each consumer group differs. To understand better the financial differences between divorced men and divorced women age 50 and older, VALS is quite helpful. VALS/MacroMonitor data provides a complete picture. (The MacroMonitor is a biennial macroeconomic survey of US households conducted by SBI's Consumer Financial Decisions.) For example, the 2016–17 MacroMonitor reports that for high-resource Thinkers, gray men divorcees have mean amounts of $70,100 in savings and $251,500 in total liquid assets. For women, the mean amount in savings is $88,100, and the mean amount in total liquid assets is $283,900; typically women are better than men at savings. Survivors are the most financially challenged of the groups. The contrast between Thinkers and Survivors is stark. Survivor men divorcees have mean amounts of $24,400 in savings and $25,000 in total liquid assets; for women, the mean amount in savings is $19,200, and the mean amount in total liquid assets is $19,200. Often, a VALS analysis of headline news provides both context and understanding of the issue. For a complete definition of liquid assets, visit CFD's References and Resources: Definitions. A 2012 AARP Bulletin ( Life After Divorce ) is a good resource to understand more about gray-divorce issues. Is Anyone Watching (Network) TV? Why-ology News is a periodic newsletter highlighting free content from the VALS team. Visit the Why-ology Library for previously-featured items and additional featured content.